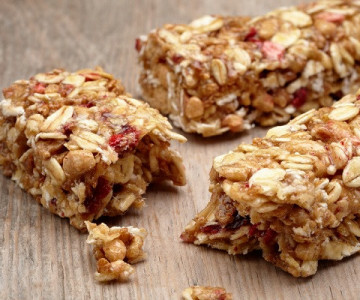 An essential recipe for days when you need breakfast on the go, this granola bar is crammed with vitamin boosting berries and cherries. 2) Place the butter, sugar and honey in a medium-sized pan and heat gently, stirring occasionally, until the butter has melted and the sugar has dissolved. 3) Remove from the heat and stir in the Granola, dried fruit and nuts. 4) Press the mixture into a lightly greased, rectangular, non-stick cake tin 20cm, 4cm deep) and bake in the oven for 15-20 minutes, or until golden brown. 5) Allow to cool in the tin for five minutes, then score lightly with a knife to make 12 bars. 6) Leave to cool completely in the tin before cutting and removing. The breakfast bar can be stored in an airtight container for up to five days.